Rom Check Fail! is not one game. Rom Check Fail! is over one thousand different games, but you can't ever choose which one you play. Oh, and each game lasts about 5 seconds. Also, a good half of them make no sense, are either virtually to completely impossible or absurdly easy. Sounds dreadful doesn't it? Yes, yes it does but you're going to love every single second of it. Crypic, near useless intros over, perhaps I should explain. Rom Check Fail! is a port of about 10 old arcade and console games, each of its 20 levels simply sees you needing to destroy all the enemies to progress. The first trick is that every 5 seconds the level graphics, player, enemies and music all change to those from a different game. 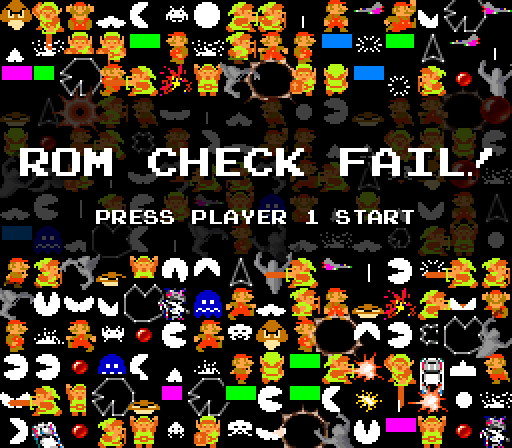 The second trick however is where Rom Check Fail! crosses the line into absolute genius. You know those level graphics, player, enemies and music? Well they're not going to be coming from the same game as each other. 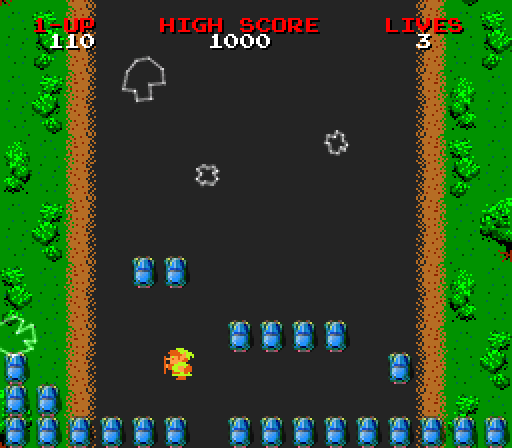 Yes, one minute you're the Asteroids ship, trying to shoot Space Invaders in a Pacman level to the Zelda theme. 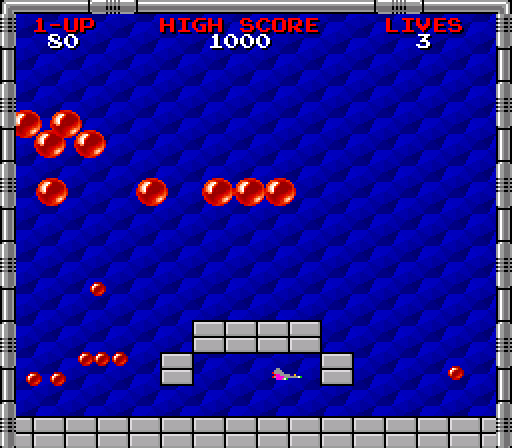 Then suddenly you're Mario trying to jump on Pang balloons then the Defender ship, shooting blocks from Arkanoid. This is where your variable difficulty comes in of course. Your player and the enemies retain their original abilities, or almost complete lack thereof. So while it's very easy to leap on a load of trapped enemies or static blocks as Mario, it's not so easy to be trapped in a Bomberman maze trying to escape Gauntlet ghosts when, as the Space Invaders ship you can't move vertically. It's almost unbelievable that no-one's thought of this idea before; it's absolutely mind-blowingly, brilliantly, simple. It would count for nought of course if it wasn't done right but here it absolutely is. Mario controls like Mario, the Asteroids ship has precisely the right inertia. Space Invaders work their way down the screen and the Pang balloons bounce around aimlessly, splitting in two when shot. The graphics are spot on, but of course they are, they're all swiped from the real games. You can't argue with the smoothness and integration of the different elements though, or the excellent corruption techniques giving you just that tiny warning of an impending change. The real star here is the sound though. The music system is absolutely excellent, doing a brilliant job of recreating the sounds of the divergent hardware the original games ran on and it switches easily between the two games with a flourish (and fairly deliberately horrible static). Rom Check Fail! is the most derivative game it's even possible to make, yet the most original thing I've played this year. It's by equal measure smart and retardedly simple. It's easy, then it's gut wrenchingly hard. It's arcade but with a surprising amount of strategy as you try to make sure you're in a safe position regardless of what's about to come next. And the completion sequence, which I won't spoil, will make any long term gamer squeal with delight. 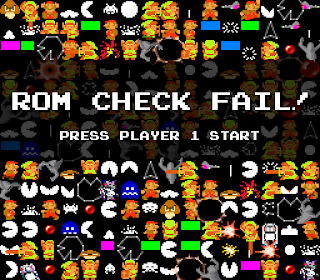 You owe it to yourself to play this, even if it's your birthday and Christmas present, Rom Check Fail! makes the sum of its parts seem like Rise of the Robots. Download the game here (from Farbs' website).